This recap is going up a day late and is very short on running. Seriously, stop here if you want to read about all the miles I logged. 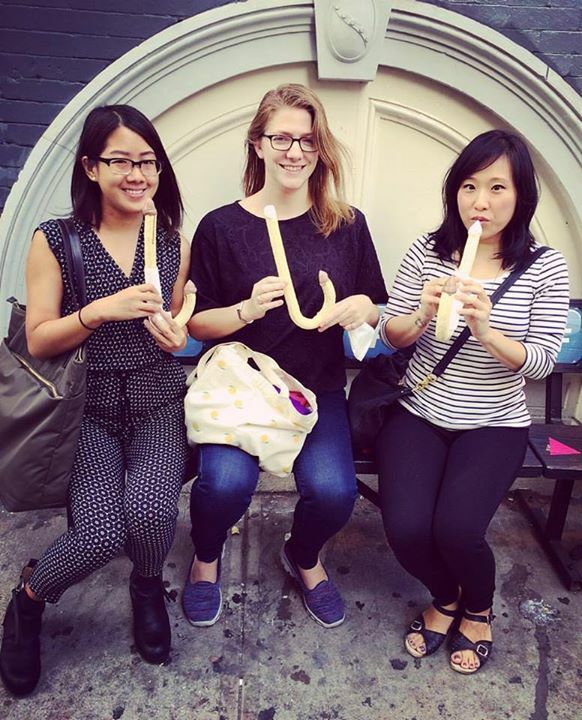 Read on if you want some ClassPass recommendations or talk about J-shaped ice cream. Tuesday: Missed a run in the morning. Showed up to the gym expecting to have time to run, but didn’t. However, I knocked out some serious weight training. My shoulders and chest were sore for days after with DOMS. Wednesday: 5 mile group run to a beer garden. I did all 5 miles very conversationally. In fact, I don’t think I’ve ever talked quite so much during a run. I as worried about getting tired legs after the big hill or around mile 3, so we kept it slow. But it was fun! We ran to a beer garden, Greenwood Park, where I happily wolfed down a (fried) chicken sandwich and fries and slowly sipped on a beer. I jogged half a mile to the subway on the way back and was experiencing some heel pain, so I made sure to foam roll and stretch after I got home. Thursday: “Ratchet Zooba”, a class put on by Banana Skirt Productions with my friend who is a regular. IT WAS SO FUN. They’re part of ClassPass and I definitely think I’m going to max out the 3x/month allotment with them. It’s really nice to take a class with friends so you can let loose and be silly. Will, the instructor was really helpful for us first-timers. There was lots of jumping around, but it felt pretty easy on the joints overall. There was also twerking. I am sad to say that our photo is not on their Instagram. I tried to really strike a pose (a crucial component of the class is voguing, so I felt briefly like I was on an episode of America’s Next Top Model when Miss J directed them on that. I never know what to do with my arms when posing in general. I got pretty sweaty, then we met with friends for BonChon. Nothing says post-workout meal like Korean fried chicken and tteukbokki covered with mozzarella. Then I went to a nearby bar to watch football, where I slowly sipped on an Oktoberfest beer while yelling at the projector. Which made my morning pretty rough. Friday: Another early wake up call for 6:30am spin class at BYKlyn. I might max out on this studio’s 3x/month allotment on ClassPass. Shoes are $3, however. This makes me wonder if I should get my own cycling/spin shoes (I do currently have access to a bike that requires them) or just keep coughing it up (I rarely have cash on me) or only go to spin studios where shoe rental is included. I survived on my <5 hours of sleep, but was going a little easy on the resistance. I finally cranked it way up on the last few songs, then had a fairly springy walk back to my apartment. At work, I made it through a Board meeting, wolfed down a Chipotle barbacoa burrito, then got to unexpectedly head home early because of Pope Francis’s visit in midtown. Needless to say, there was lots of cold brew and a nap and I STILL went to sleep at 10:30pm. My running pal Carla always says “it’s the night before the night before” so I felt good about how well-rested I was going to be. Saturday: Rested those legs, aside from some walking around Manhattan. During said stroll. I received 2 boxes of free Pocky from a truck, which I am currently munching on. The promo lady asked which flavor was my favorite (they were just handing out chocolate) and I had to say green tea but also the one with the panda on it, which is cookies & cream. I’d better start drafting my posts on snacks. While shopping with friends in SoHo, I finally got to try Play J ice cream on its final weekend. So nice I had to get it twice (went Sunday as well). I got the combo vanilla/chocolate and it was great. The cone sort of tastes and has a similar texture to Kix cereal. I’m bummed they won’t be parked in SoHo for the fall. I had a brief evening excursion to Queens but was again in bed at 10:30pm, ready enough for that 5:30am wakeup call. Sunday: Bronx 10 Mile day of reckoning. Recap to come, but I’m pretty much all smiles despite my slowness.